Revolution Brass Band. 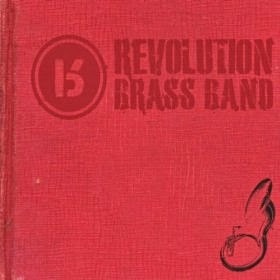 Revolution Brass Band. Every town needs a brass band. Historically, just about every town around here had one, although the style of music back then was more in the fashion of marches, waltzes, and quadrilles. The Revolution Brass Band has a slightly more funky style, along the lines of New Orleans “second line” bands of Mardi Gras, but not quite so traditional. Recorded in late 2012 at Bad Racket Studios in Cleveland, these guys do quite a nice job on their debut album. 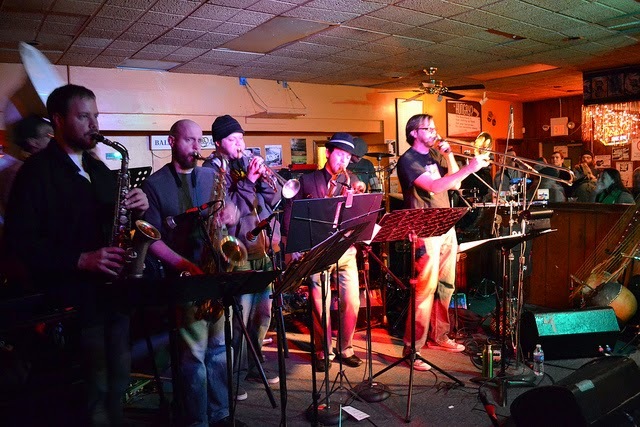 An 8-piece band formed in 2010, and playing their first gig at Edison’s Pub in Tremont, they’ve been hitting all the bars in the area, and even been featured at Parade the Circle. I’m really happy I found this album. It’s got a good-time groove, great playing all around, and combines several jazz styles I enjoy. Their next scheduled appearance is at the Hessler Street Fair, on May 17th. Catch them in person. Personnel: Jacob Wynne (trumpet), Kris “Skinnyk” Morron (trombone), Steve Zombory (alto saxophone), Dan Wenninger (tenor saxophone), David Kasper (baritone saxophone, flute), Cutty (sousaphone), Tim Lane (drums), Matt Hadaway (percussion). Tracks: 76er, Keep on Steppin, Numbers Above, Trenches, Fatguy Shuffle, Equality, Bring on the Revolution, Shoreliner. The Midnight Slander. The Long Way Home. 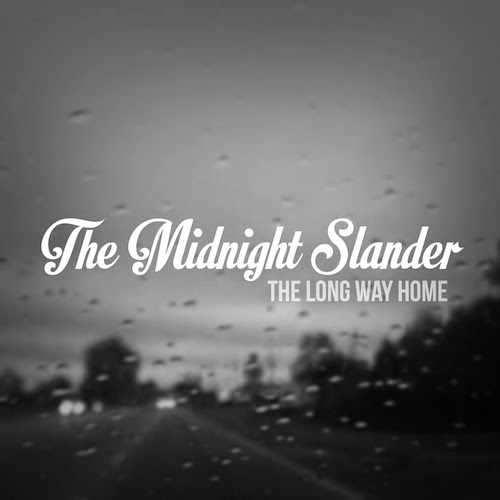 The Midnight Slander is a Cleveland band, I think. But the lead singer spent time in South Carolina, so you think you’ll hear something Southern. I guess there is, but not as much as you’d expect. They’re a trio. But they sound like a four-piece outfit, because the drummer also plays keyboards at the same time (I can’t brush my teeth and scratch myself at the same time). Their music sounds familiar, but not in a ripoff kind of way. More of a comfortable way. Laid back Chili Peppers with early Doobie Brothers mixed in. Mellow Black Crowes. Van Morrison living in Ohio. Is there such a thing as alt.roots rock? I don’t know if these are actual influences, but this is what I hear as I work my way through their first full-length album. They put out an EP before this, but I haven’t heard it. Maybe I ought to, because this one's really good. Most of this was recorded at Lava Room Studios in Cleveland, with some unspecified stuff done in Charleston, South Carolina. Nine tunes, and each one is something different. The instruments are the same, but the band changes styles, going from rockish to funkish to swampish. Dave Conner, the lead singer, moves with it, and while sometimes he paces himself like Anthony Kiedis or Chris Robinson, he sounds sort of like a folk singer too. It’s a good sound, because he doesn’t really sound like anybody I can think of. “Shattered” isn’t the Rolling Stones tune. It’s probably the most “southern rock” song on the album. Solid, chunky rhythms make it kind of odd, but cool. “Runaway” takes off faster, and gives me that Doobies feeling, and Conner’s singing on “Bright Lights” reminds me of Meat Loaf, but the rhythm is solidly Creedence in style. “Ohio” isn’t the CSNY song, and I’m glad. It’s funkier and not such a downer, with a Paul Simon lyric takeoff. Conner’s voice gets gruff and dirtier (not that way) on “Love.” The organ solo is a nice touch. A couple of obligatory ballads show off their tender side. There are a lot of damn fine tunes here! It’s not an earth shattering album, but they say on their website that they’re not trying to do that. The music’s fun. Excellent rhythms keep you moving, vocals are engaging, and the musicians do a great job. My game of “catch the influence” shouldn’t stop you from checking these guys out. They’re on the bill at the Agora this Saturday, so no excuses. Personnel: Dave Conner (guitar, vocals), Mike Gray (drums, keys, vocals), Al Rodriguez (bass, vocals). Tracks: Shattered, Runaway, Bright Lights, Ohio, Chords, Love, Open Road, Tennessee, For You. Hey Mavis. What I Did. We reviewed Hey Mavis’ previous album, Honey Man, almost exactly two years ago. It seems like more but here it is, and we are exceedingly happy. Much of the core of the band is the same, except that Brent Kirby has been busy with some other projects and appears on only a couple of tracks here (and co-wrote four songs with Laurie). I really enjoyed the vocals Kirby brought to the group on the previous album, but Caner, Caner, and Thomas shoulder on with help from some other fine musicians. Recorded in churches in Bath and Kent, with production by Adam Aijala (of the Yonder Mountain String Band), and engineering by Don Dixon, the album has a crystal clear quality to it, whether listening to it with good headphones or cheap laptop speakers. It seems fuller, more expansive than previous albums. The group’s sound has changed a bit too, but not so much that you wouldn’t know it was them. They're still an Americana band in the truest sense of blending folk, country, jazz, and other musical elements into a seamless whole. They continue to refine their sound and their vision of what it is they want to do. So, where to begin? The problem is that there is no single thing to point to that makes it a great album. It’s not just Laurie’s banjo, or her voice, which makes me slightly weak in the knees (yes, I admit it) with its combination of sweetness and strength, darkness and light. Eddie’s soaring fiddle and moaning viola add enormously to the overall feel, but that’s not the whole of it. Bryan’s bass brings solidity and depth to the music (and he’s so much fun to watch on stage! ), but no, it’s not just him. The songwriting on this album equals or surpasses, on average, the amazing songs on Honey Man, but they only come to life in the performance. All of these things work together, and perhaps the explanation is that the group is just two years older and further along in the sophistication of their interaction as a band. I also find it difficult to single out favorite songs, because each time I listen I end up with a different two or three. The first time through, it was the trio of songs near the beginning, “Looking Back,” “Longing for the Past,” and “The Love We Give,” two of which were co-written by Laurie and Brent. In the first two Laurie’s voice alternates between hurt innocence and bitter resignation, the harmonies are gorgeous, and the instrumentation full and rich. The third has a faster tempo, the hooks are strong, and the solos are a delight. It’s no wonder they chose this one as their first professionally produced video (https://www.youtube.com/user/HeyMavisMusic). Next time through I was in more of a “Mon Bijou” mood, with its sultry atmosphere set by the fine viola and guitar work, but “Wedding Gown” caught my attention with its country mood, and the harmonies in “What Am I Without You” stand out. My wife thinks the title track is the best song. 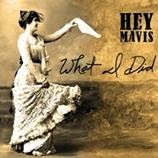 Hey Mavis is clearly on an upward trend, with this album just one obvious example. 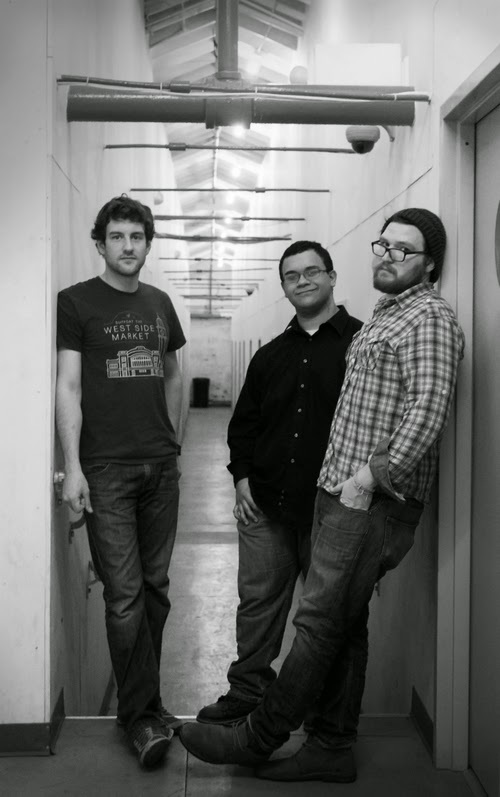 They appeared on the NPR show Mountain Stage, and are scheduled to reappear on May 1st. They’re getting more press and more airplay. The CD release show at the Happy Days Lodge in Peninsula was packed and fabulous, with the addition of drummer Anthony Taddeo and guitarist Kevin Johnson. And they’ll be playing in Lakeside, Morgantown, and Pittsburgh. See them when you can. Personnel: Laurie Michelle Caner (banjo, lead and harmony vocals), Eddie Caner (fiddle, viola profunda, string arrangements), Bryan Thomas (bass, percussion, Chank-o-Matic 6000); with additional musicians: Adam Aijala (acoustic guitar), Don Dixon (electric guitar, percussion, other cool stuff), Mark Gonder (drums), J. J. Juliano (drums on tracks 1 & 4), Brent Kirby (acoustic guitar on tracks 1 & 4). Tracks: What I Did, Looking Back, Longing for the Past, The Love We Give, Graveyard Stone, Mon Bijou, Wedding Gown, What I Am Without You, Hairbrush, Honey on the Hill. Henry Mancini. 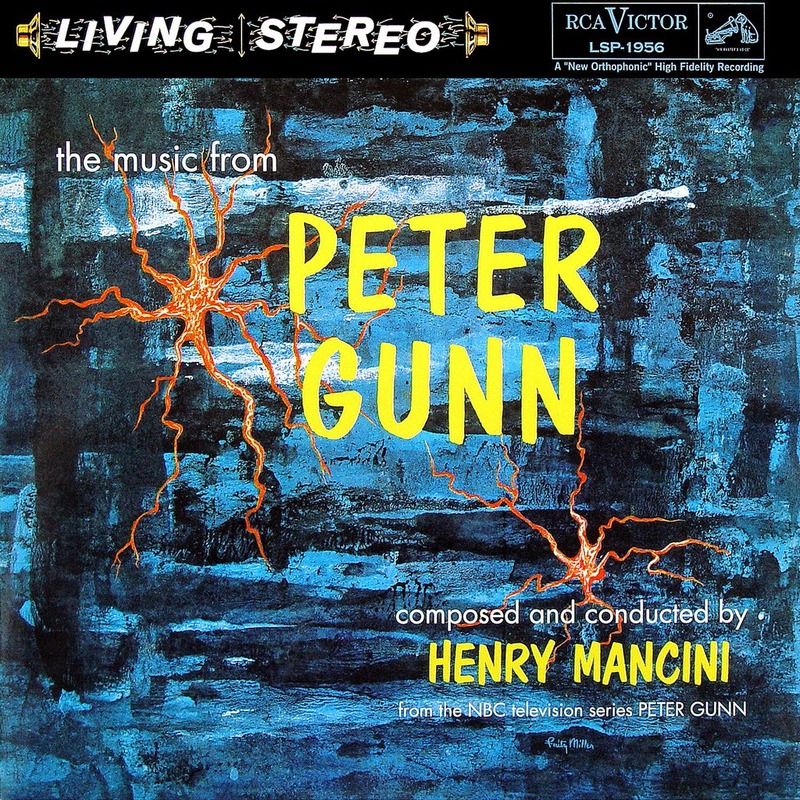 Music for Peter Gunn. 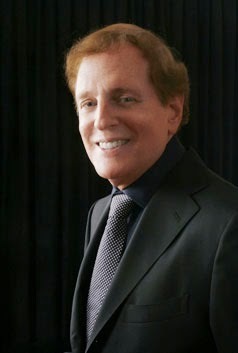 Steven Richman. Harmonia Mundi, 2014. Why are we reviewing this? 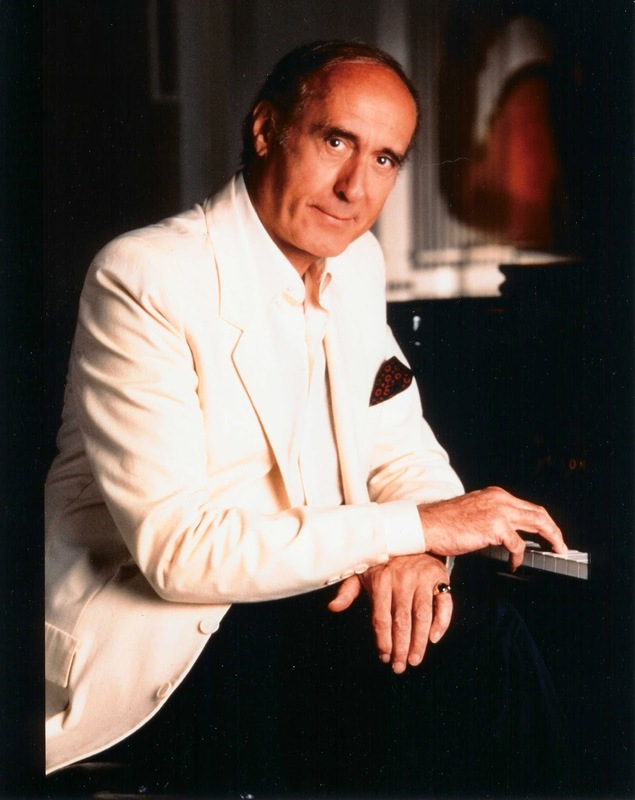 Although the band is from New York, Henry Mancini was born in the Little Italy neighborhood of Cleveland, and despite the family moving to West Aliquippa when he was young, we can still claim him. We are greedy and tenacious with regard to our musicians, and Mancini is much too hard to just give away to Pennsylvania. His fame and fortune came in the 1950s in Hollywood, where he scored numerous motion pictures, then television shows. The 1958 TV series Peter Gunn was one of his breakthroughs, in which jazz, specifically cool jazz, was featured prominently in the series, leading to many imitators as well as an increasing acceptance of jazz in mainstream media. In 114 episodes from 1958 to 1961, Gunn, played by Craig Stevens, solved crimes in a fictional riverfront city in a sophisticated and hip fashion. So hip was the show that jazz musicians made cameo appearances, including Shelly Manne and Shorty Rogers. While the show was popular in the heyday of crime TV shows, far more popular was the music, which won Mancini best selling albums, Emmy and Grammy Awards. The music has been recorded by others, including Ray Anthony (who grew up in Cleveland, by the way). The music was intended to be essentially “incidental” music, as background to the action of the show, but it’s all so good that it became a central feature and has had a life of its own far beyond the half-forgotten TV series. While some of the music has appeared here and there, nobody recently has tackled the bulk of the music as a unit until Mr. Richman and his ensemble. Harmonie Ensemble tackles both classical music and jazz, ranging from Stravinsky to Miles Davis. However, much of their bread and butter comes from the gray area in-between: Gershwin, Copland, Grofé, Ellington. 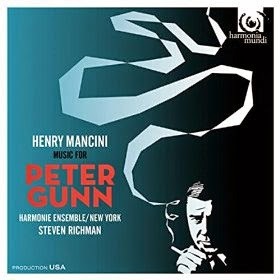 Mancini fits somewhere in here as well; not exactly a jazz musician (although he worked with Tex Benecke in the , not really purely anything else, but so massively talented a composer that he could move in any direction. The challenge for the group is to make the music sound as authentic as possible while not ending up with a period piece. They succeed admirably. The Theme is of course the most famous piece on the album. Part jazz, but with some rock chops built in, it’s no wonder the tune became a favorite among surf music bands. Here, it punches just right, with a strong guitar coming up against the brass and saxes. The tune is magnificently constructed for maximum effect as an earworm. Other tunes fit other moods, ranging from the extra cool “Sorta Blue,” to the cheerful “The Brothers to Mother’s,” to the soft cocktail moments of “Dreamsville,” to the heavy action of “Spook,” each depicting an appropriate feel for a scene. Richman never strays far from the original, but he doesn’t really need to. 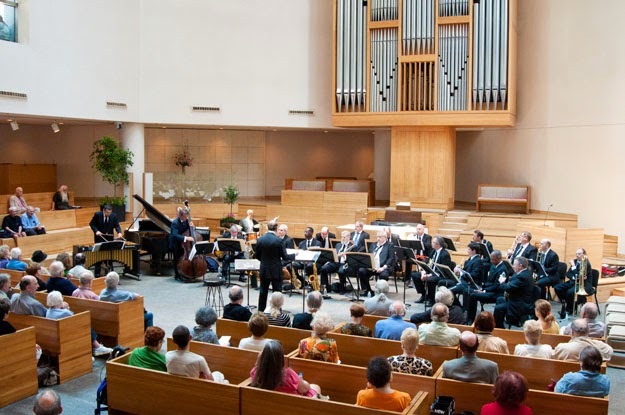 The music stands tall, and the group plays with strength, style, and reverence. This is music to get lost in, to paraphrase Chet Baker. Cool, sophisticated, and delightfully played by a fine ensemble (trombonist John Fedchock is also a Clevelander), this is an excellent album for anyone who enjoys big band music, cool jazz, or television theme music from an earlier era. I’m knocked out. Personnel: Steven Richman (conductor). Reeds: Mark Gross (alto sax, alto flute), Lawrence Feldman (alto sax, alto flute), Lew Tabackin (tenor sax, alto flute), Lino Gomez (tenor sax, alto flute), Ronnie Cuber (baritone sax). Trumpets: Lew Soloff, Dominic Derasse, Joe Giorgianni, Stanton Davis. French Horns: R.J. Kelly, Alexandra Cook, Eric Davis, David Peel. Trombones: Larry Farrell, John Fedchock, Mark Patterson, Frank Cohen. Bob Mason (guitar), Christos Rafalides (vibes), Lincoln Mayorga (piano), Francois Moutin (bass), Victor Lewis (drums). Tracks: Peter Gunn Theme, Sorta Blue, The Brothers to to Mother’s, Dreamsville, Session at Pete’s Pad, Soft Sounds, Fallout, The Floater, Slow and Easy, A Profound Gas, Brief and Breezy, My Manne Shelly, Blue Steel, Blues for Mother’s, Blue Street, Spook, Peter Gunn Theme (reprise). The Valentinos. Lookin' for a Love. The Valentinos. 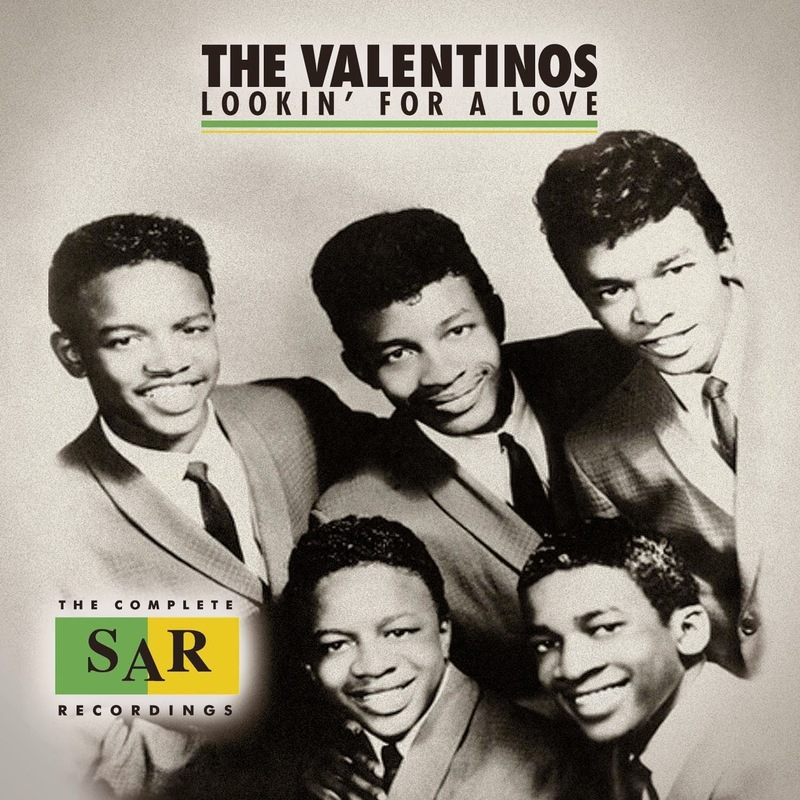 Lookin’ for a Love: The Complete SAR Recordings. ABKCO Music & Records, 2014. You may be wondering who the Valentinos are. They also went by another name, the Womack Brothers, who might be more familiar either through their gospel music, or through Bobby Womack’s rather larger musical career. Brothers Friendly, Jr., Curtis, Bobby, Harry, and Cecil (as fate would have it, only the oldest two are still alive) began their career at their father’s church at East 85th & Quincy. They cut a secular single in 1954 for Pennant Records, a Cleveland label, but it didn’t go far. However, they happened to meet the Soul Stirrers when they were coming through town, and the lead singer, Sam Cooke, changed their lives. He signed them to his SAR Record label in 1960 and they recorded two more singles under the Womack Brothers name. 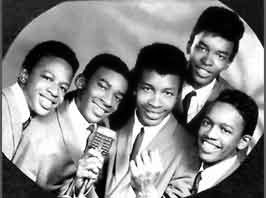 When they didn’t hit, Cooke suggested they try soul music, and they changed their name to the Valentinos. They recorded for SAR from 1961-1964, until Cooke’s death. After a hiatus, they were picked up by Chess, and later Jubilee Records. Eventually, the brothers did background vocals for Bobby on his albums. I’ve skipped over all the scandal and personal stuff, and you can look that up for yourself. This package contains 23 tracks they recorded for SAR from 1961-1964. Included are the two gospel songs to start off the album, “Somebody’s Wrong,” and “Couldn’t Hear Nobody Sing.” Two other gospel tracks (the B sides) bookend the soul tracks, having been released under the Womack Brothers name. Aside from the lyrics, the styles are nearly identical to the soul tracks, the Brothers having transferred a great deal of their singing style over to the secular side. Bobby sang some leads, Curtis sang others (with Curtis sounding a bit like Sam Cooke). Songs were written by various folks, but most prominently Curtis, Bobby, and Sam Cooke himself. As for the songs themselves, they’re exquisite, shining gems of early 60s soul music. I can’t believe how quickly I was transported back to that time, even though I have never heard most of the tunes. Some made the R&B charts, but only two are recognizable (aside from the gospel song “Couldn’t Hear Nobody Pray,” which is a standard in the genre). “Lookin’ for a Love to Call My Own” was an R&B hit, but I doubt if I heard it back when I was a 10 year old suburbanite. It’s familiar because it was recorded by the J. Geils Band in 1971, and remade by Bobby Womack in 1974. The other was a big hit not for the Valentinos (their version peaked at #94 on the Billboard Charts), but for the Rolling Stones. “It’s All Over Now” was covered by them a month later, a blow that was made less painful by the royalty check Bobby got as the co-writer. But whether the songs are familiar or not, they’re a pure delight to a fan of the music of this period. Soul with strong gospel and pop influences, a good dose of Sam Cooke, a touch of Chuck Berry, and occasional doo-wop vocals (“Don’t Go Away” is a classic in this regard). Every song has something special, and each is a time capsule, delivered in less than three minutes. The final track on the album features Sam Cooke giving instructions to the group on how to handle the tune “Sugar Dumpling,” directing handclaps and initial harmonies. This is a remarkable collection and a well-produced historical document of a time of sweet soul music and young artists with remarkable potential and the world before them. Personnel: Friendly Womack, Jr. (vocals), Curtis Womack (vocals), Bobby Womack (vocals, guitar), Harry Womack (vocals, bass), Cecil Womack (vocals, guitar), Rene Hall (session leader, 1962, 1964), Harold Battiste (session leader, piano, celeste, 1964), various session musicians. Tracks: Somebody’s Wrong; Couldn’t Hear Nobody Pray; Lookin’ for a Love; Darling, Come Back Home; I’ll Make It Alright; I’ve Got a Girl; Tired of Livin’ in the Country; Don’t Go Away; She’s So Good to Me; Baby, Lot’s of Luck; It’s All Over Now; I’ve Got a Love for You; Rock in the Cradle of Love; Somewhere There’s a Girl; Sugar Dumpling; Bitter Dreams; Everybody Wants to Fall in Love; Put Me Down Easy; To Show My Love; Shakin’ This Way and That (Lassie); Tired of Livin’ in the Country; Yield Not to Temptation; Somewhere There’s a God; Sam Cooke in the Studio.